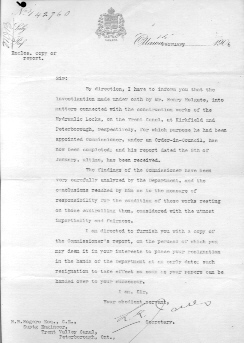 By direction, I have to inform you that the investigation made under oath by Mr. Henry Holgate, into matters connected with the construction works of the Hydraulic Locks, on the Trent Canal, at Kirkfield and Peterborough, respectively, for which purpose he had been appointed Commissioner, under an Order-in-Council, has now been completed; and his report dated the 8th of January, ultimo, has been received. The findings of the Commissioner have been carefully analyzed by the Department, and the conclusions reached by him as to the measure of responsibility for the condition of these works resting on those controlling them, considered with the most impartiality and fairness. 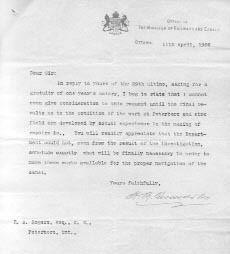 I am directed to furnish you with a copy of the Commissioner's report, on the perusal of which you may deem it in your interests to place your resignation in the hands of the Department at an early date; such resignation to take effect so soon as your papers can be handed over to your successor. In compliance with the intimation contained in your letter of the 14th inst. I hereby tender my resignation as Superintending Engineer of the Trent Canal. 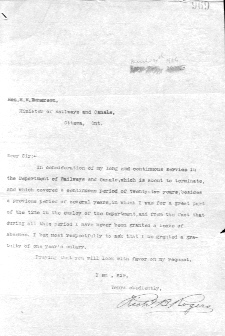 In consideration of my long and continuous service in the Department of Railways and Canals, which is about to terminate, and which covered a continuous period of twenty-two years, besides a previous period of several years, in which I was for a great part of the time in the employ of the Department, and from the fact that during all this period I have never been granted a leave of absence, I beg most respectfully to ask that I be granted a gratuity of one year's salary. Office of the Minister of Railways and Canals. 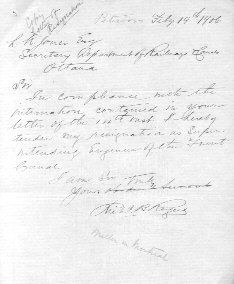 In reply to yours of the 29th ultimo, asking for a gratuity of one year's salary, I beg to state that I cannot even give consideration to this request until the final results as to the condition of the work at Peterboro and Kirkfield are developed by actual experience in the making of repairs &c., You will readily appreciate that the Department could not, even from the result of the investigation, conclude exactly what will be finally necessary in order to make these works available for the proper navigation of the canal.